These are the beauty products that we don’t usually find too interesting, but are a huge part of the daily routine… it’s good old shampoo & conditioner. I’ve struggled for years to find a combination that doesn’t weigh my hair down, doesn’t leave it feeling greasy and manages to keep frizz at bay. I think I may have found the right pair! 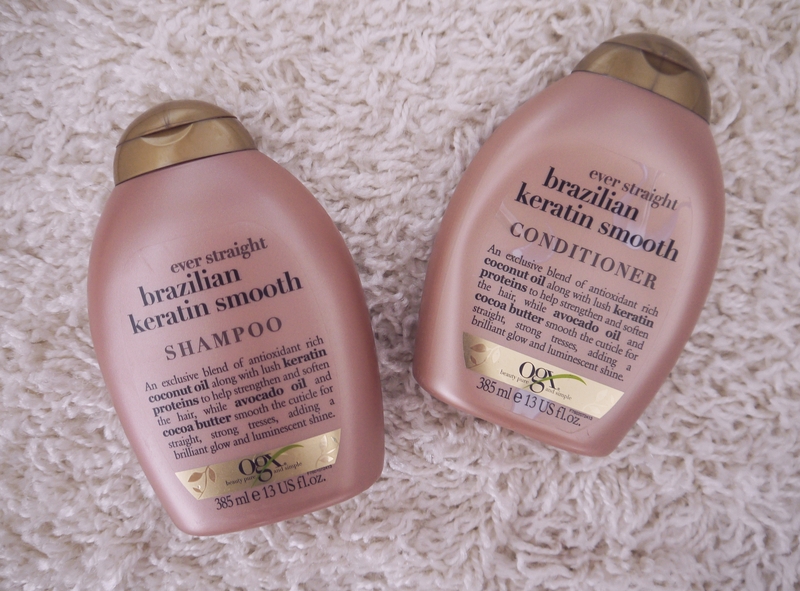 I picked up the Organix Ever Straight Brazilian Smooth Shampoo & Conditioner a good month ago from Superdrug while they were on special offer, as I don’t think I could have justified spending £14 on shampoo and conditioner I’d never tried before. I hadn’t heard much about the Organix brand, so I was unsure what to expect. I’ve now been using the combo around 3 times a week and have become worthy of a review as there’s not a lot to read on the web! When I eyed up this range, the ‘ever straight’ claim didn’t play a large part into me picking it up. Whilst I love having straight tresses on the occasion, I often favour a wavier look day to day. I do find having straight hair a good base to create a wavy but polished look, which is what I’ve been going for lately. My hair is fairly straight naturally anyway, so unfortunately I can’t comment on the validity of the ‘ever straight’ claim. But, I can comment on the changes I’ve noticed. As I mentioned before, my hair is looking far more polished than ever before. I don’t have to deal with frizz, and I’ve also found I’m less reliant on hairspray. While I wouldn’t go as far to say it’s luminescent, it definitely has a shine. One thing I love about being brunette is getting the shine back! With the talks of shine, the coconut and avocado oil ingredients can make you wonder if the shine verges on greasiness. However I haven’t suffered from this; the oils give me that ‘brunette’ shine and the coconut scent is amazing. I often find my hair still smelling of coconut later on in the day, and not many shampoo/conditioners have that much ‘smell’ longevity. The keratin has done wonders for the quality of my hair day to day; it feels thicker, and is super soft after drying. If you love volume and texture, you may be put off from this range, but adding a good texturising spray or a bit of dry shampoo to your styling regime still lets you achieve a look with a bit more kick. While I can’t say this range achieves long term results, it’s definitely a combo I’ll be continuing to purchase, and makes me very intrigued by the rest of Organix’s products! So this Organix range is my new favourite discovery! Have you tried any of their products?